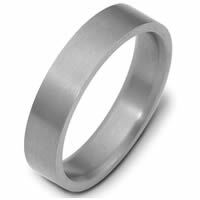 Titanium 5mm Wide Comfort Fit Wedding Band - Titanium, 5.0 mm wide, comfort fit titanium wedding band. The finish is brushed. Other finishes may be selected or specified. 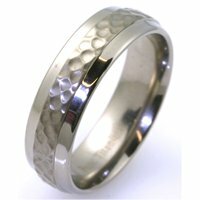 Titanium-Gold, Comfort Fit, Wedding Band - 14kt white gold and titanium, comfort fit, 7.0 mm wide wedding band. The center is a brush finish and the outer edges are polished. Different finishes may be selected or specified. 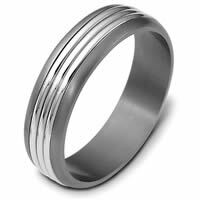 Titanium 8mm Comfort Fit Wedding Band - Titanium, 8.0 mm wide, comfort fit plain wedding band. The finish on the ring is polished. Other finishes may be selected or specified. Titanium-14kt White Gold Comfort Fit Wedding Band - 14 kt white gold and titanium, comfort fit, 6.5 mm wide wedding band. The center is a matte finish and the outer edges are polished. Different finishes may be selected or specified. Titanium-Gold Comfort Fit 7mm Wedding Band - 14 kt white gold and titanium , comfort fit, 7.0 mm wide wedding band. The ring has a beautiful pattern in the center. The two pieces on each side of the patterned gold are matte finish. The rest of the band is polished. Different finishes may be selected or specified. Classic Wedding Bands - 14 kt white gold and titanium, 5.0 mm Wide Comfort fit, Wedding Band. The ring is a matte finish. Different finishes may be selected or specified. 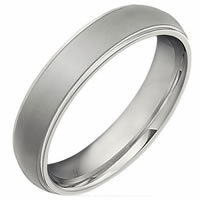 Titanium Plain 3mm Comfort Fit Wedding Band - Titanium, 3.0 mm wide, comfort fit, wedding band. The finish on the ring is polished. Other finishes may be selected or specified. 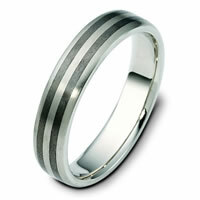 Titanium-14 K Gold, Comfort Fit Wedding Band - 14 kt white gold and titanium, 6.0 mm wide wedding band. The white gold is polished and the titanium is matte. Different finishes may be selected or specified. Titanium-14K Gold, Comfort Fit,Wedding Band - 14 kt white gold and titanium, comfort fit Wedding Band 7.5 mm wide. The ring is a brush finish. Different finishes may be selected or specified. 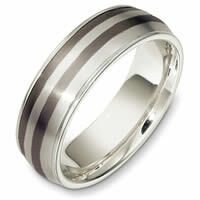 Titanium-14 K Gold Two-Tone Wedding Ring - 14 kt white gold and titanium, comfort fit, 6.5 mm wide wedding band. The raised pieces are polished and the rest is matte. Different finishes may be selected or specified. 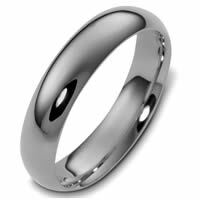 Titanium-14 K Gold Comfort Fit Wedding Band - 14 kt white gold and titanium, comfort fit Wedding Band 7.0 mm wide. The ring has milgrain on each side. The center is a brush finish and the outer edges are polished. Different finishes may be selected or specified. 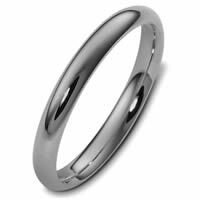 Titanium- 14kt Gold Comfort Fit, 6.0mm Wide Wedding Band - 14 kt white gold d and titanium , comfort fit, 6.0 mm wide wedding band. The center of the ring is brushed and the rest is polished. Different finishes may be selected or specified. 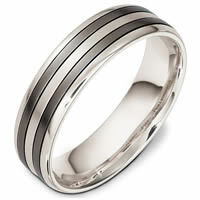 Titanium-14 K Gold Comfort Fit Wedding Band - 14 kt white gold and titanium , comfort fit, 5.0 mm wide wedding band. The whole ring is a matte finish. Different finishes may be selected or specified. 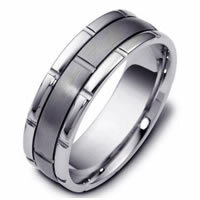 Titanium 6mm Wide Comfort Fit Wedding Band - Titanium, 6.0 mm wide, comfort fit titanium wedding band. The finish is brushed. Other finishes may be selected or specified. 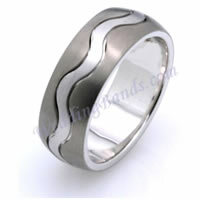 Titanium 6.0mm Wide Men's Wedding Band - Titanium, plain , 6.0 mm wide, comfort fit wedding band. 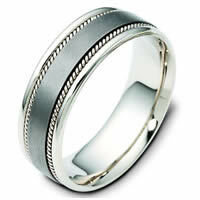 This is a plain wedding band and is polished. Different finishes may be selected or specified. 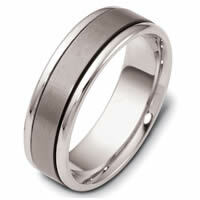 Titanium Traditional Plain 4mm Comfort Fit Band - Titanium, plain, comfort fit, 4.0 mm wide wedding band. The finish on the ring is polished. Other finishes may be selected or specified. Titanium 5mm Comfort Fit Wedding Bands - Titanium, 5.0 mm wide comfort fit plain wedding band. The finish on the ring is polished. Other finishes may be selected or specified. 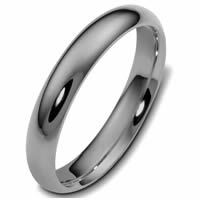 Titanium-14 K Gold Comfort Fit, 7.0mm Wide Wedding Band - 14 kt white gold and titanium, comfort fit, 7.0 mm wide wedding band. The titanium portion is satin matte finish and the white gold is polished. Different finishes may be selected or specified. 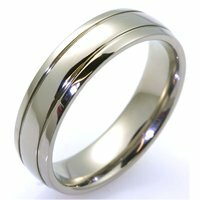 14 K Gold-Titanium Comfort Fit, 7.5mm Wide Wedding Band - 14 kt white gold and titanium, 7.5 mm wide, comfort fit wedding band. The titanium portion is a matte finish. On each side of the titanium piece is milgrain edges and the outer edges is polished. Different finishes may be selected or specified. Titanium and 14 K Gold Band. 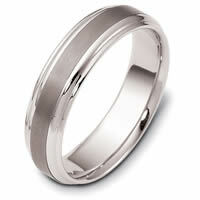 - 14 kt white gold and titanium, comfort fit Wedding Band 7.0 mm wide. 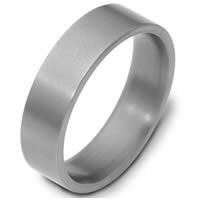 The center of the ring is a satin matte finish and the outer edges are polished. Different finishes may be selected or specified. 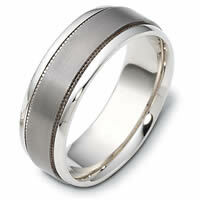 Titanium-14K Gold Comfort Fit Wedding Band - 14 kt white gold and titanium , comfort fit, 7.0 mm wide wedding band. The ring has 3 handmade ropes inlayed in the ring. The two flat pieces in the center have a matte finish. The rest of the band has a polished finish. Different finishes may be selected or specified. Titanium-14 K Gold, Comfort Fit Wedding Band - 14 kt white gold and titanium, comfort fit Wedding Band 6.0 mm wide. The ring is a brush finish. Different finishes may be selected or specified. 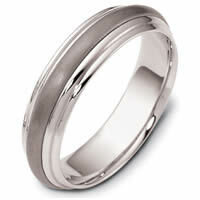 Titanium-Gold Comfort Fit, 5.5mm Wide Band - Titanium and 14kt white gold classic, comfort fit, 5.5mm wide wedding band. The ring has a matte finish in the center and the rest polished. Different finishes may be selected or specified. 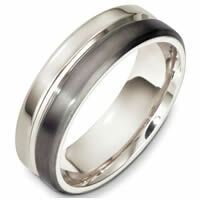 Titanium-Gold Comfort Fit Wedding Band - 14K White gold and titanium, comfort fit, 8.5 mm wide ring. The ring is a brush finish. Different finishes may be selected or specified. 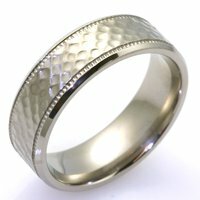 Titanium-14 K Gold 6.0mm Wide, Comfort Fit, Wedding Band - 14 kt white gold and titanium, comfort fit, 6.0 mm wide wedding band. 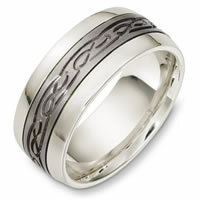 The ring has the greek key pattern around the whole band with a milgrain on each side. The center is matte and the outer edges are polished. Different finishes may be selected or specified. Titanium and 18 Kt White Gold Wedding Band - Titanium and 18 Kt White gold wedding band, 7.5 mm wide, comfort fit wedding band. The finish on the ring is matte. Other finishes may be selected or specified. 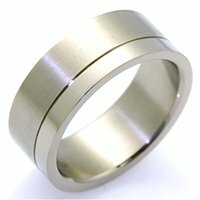 Titanium and Gold Wedding Band - Titanium and 14 kt Rose Gold 6.0 mm Comfort Fit Wedding Band. The edges are beveled. The rose gold is polished and the titanium is matte. Different finishes may be selected or specified. Titanium and 14kt Wedding Band - Titanium and 14kt white gold contemporary, comfort fit, 7.0mm wide wedding band. The titanium portion is a matte finish and the white gold is polished. Different finishes may be selected or specified. 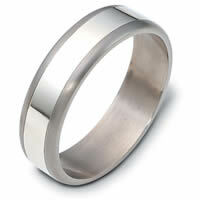 Titanium-14 K Gold Comfort Fit Wedding Band - 14 kt white gold and titanium , comfort fit, 6.0 mm wide wedding band. The titanium portion is matte finish and the rest is polished. Different finishes may be selected or specified. Titanium and 18 Kt White Gold Wedding Band - Titanium and 18 kt white gold wedding band, 9.0 mm wide, comfort fit wedding band. The center has a carved design with a matte finish. The outer edges are polished. Different finishes may be selected or specified. Titanium and 18kt Wedding Band - Titanium and 18kt white gold contemporary, comfort fit, 7.0mm wide wedding band. The titanium portion is a matte finish and the white gold is polished. Different finishes may be selected or specified. 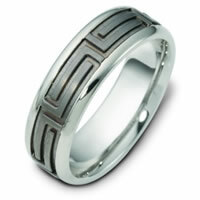 Greek Key Carved Wedding Ring - Titanium contemporary greek key, carved, comfort fit, 8.0mm wide wedding band. 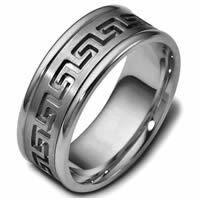 The ring has a beautiful greek key pattern around the whole ring. It is a matte finish in the center, polished on the edges, 8.0mm wide and comfort fit. 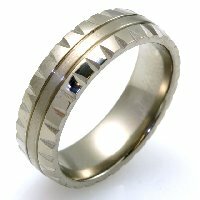 Titanium-Gold Comfort Fit 7mm Handmade Wedding Band - 14Kt white gold and titanium, brushed center comfort fit, 7.0 mm wide wedding band. The ring has 2 handmade ropes inlayed on each side. The whole ring is polished. Different finishes and combinations may be selected or specified. 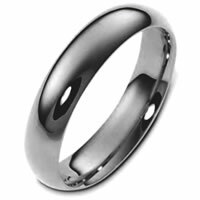 Titanium & 14kt Classic Wedding Ring - Titanium and 14kt white gold classic, comfort fit, 6.0mm wide wedding band. The ring has a matte finish. Different finishes may be selected. Titanium & 14kt Classic Wedding Ring - Titanium and 14kt white gold classic, comfort fit, 7.0mm wide wedding band. 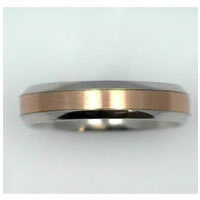 The ring has a matte finish in the center and the edges are polished. Different finishes may be selected or specified. 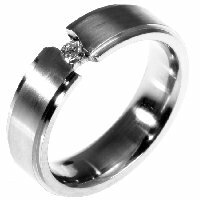 Titanium & 14kt Classic Wedding Ring - Titanium and 14kt white gold classic, comfort fit, 4.0mm wide wedding band. The ring has a polished finish. Different finishes may be selected. 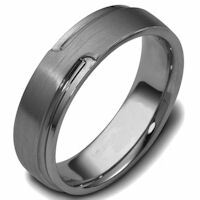 Titanium Classic Carved Wedding Ring - Titanium classic carved, comfort fit, 8.0mm wide wedding band. 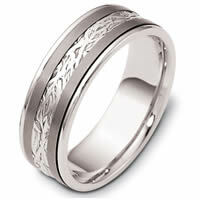 The ring has 3 straight carved lines around the whole band with a matte finish. It is 8.0mm wide and comfort fit. 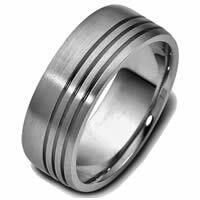 Titanium Classic Carved Wedding Ring - Titanium classic carved, comfort fit, 8.0mm wide wedding band. The ring has 3 carved slanted lines around the whole band. It is 8.0mm wide, comfort fit and has a matte finish. 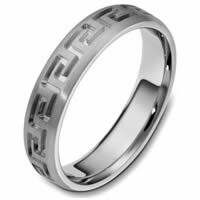 Greek Key Carved Wedding Band - Titanium contemporary greek key, carved, comfort fit, 5.0mm wide wedding band. 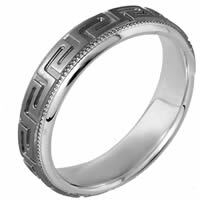 The ring has a beautiful greek key pattern around the whole band. It is a matte finish, 5.0mm wide, and comfort fit. The grooves are polished. Different finishes may be selected or specified. 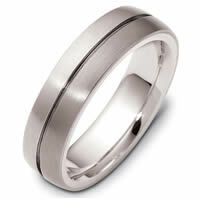 Titanium-14 K Gold Comfort Fit Wedding Band - 14 kt white gold and titanium , comfort fit, 6.0 mm wide wedding band. The titanium portion is matte finish and the edges are polished. Different finishes may be selected or specified. Titanium & 18kt Classic Wedding Ring - Titanium and 18kt white gold classic, comfort fit, 4.0mm wide wedding band. The ring has a polished finish. Different finishes may be selected. 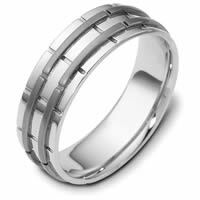 Titanium-Gold Comfort Fit, 5.5mm Wide Wedding Band - Titanium and 18kt white gold classic, comfort fit, 5.5mm wide wedding band. The ring has a matte finish in the center and the rest polished. Different finishes may be selected or specified. Titanium & 18kt Classic Wedding Ring - Titanium and 18kt white gold classic, comfort fit, 7.0mm wide wedding band. The ring has a matte finish in the center and the edges are polished. Different finishes may be selected or specified. Titanium & 18kt Classic Wedding Ring - Titanium and 18kt white gold classic, comfort fit, 6.0mm wide wedding band. The ring has a matte finish. Different finishes may be selected. 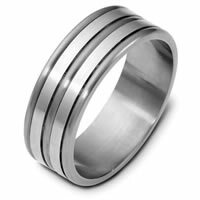 Titanium-18K 5.0mm Wide Comfort Fit Wedding Band - Titanium and 18kt white gold classic, comfort fit, 5.0mm wide wedding band. 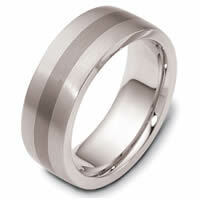 The ring has a polished finish in the center and matte finish on the titanium portion. Different finishes may be selected or specified. 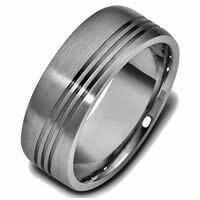 Titanium Carved Wedding Ring - Titanium, carved, comfort fit 6.0 mm wide wedding band. 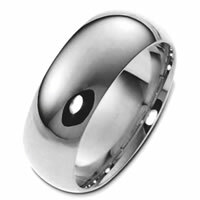 The raised portion of the ring is brushed finish and the other part is polished.. Other finishes may be selected or specified. 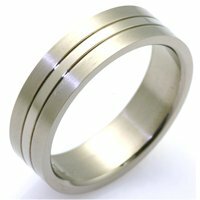 Titanium Unique Wedding Band - One titanium comfort fit wedding band. 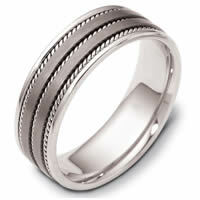 The wedding band has unique design center matte finish and the sides are high polished.